Boasting comfortable and spacious accommodation over three floors, easily accessed by our lift, clients have a choice of living and dining rooms close by their bedroom. Comfy lounges and stunning gardens and a car park allow relatives and friends to call in anytime to visit. Our beautifully tended gardens surround the home on every side and mean we really do have rooms with a view. For the green fingered, gardening sessions and specially adapted raised beds, mean that everyone can take part. If you’d rather sit back and enjoy the fresh air, our sheltered patio areas with sunshade and gazebos allow everyone to enjoy the outdoors even when it’s not blazing sunshine! Our purpose built facilities means we’ve thought of everything. From treatment rooms for visiting healthcare professionals and state of the art bathrooms on each floor to a hairdressers salon, comfortable lounges and a direct dial telephone system, we do all we can to ensure life at Ferguson Lodge is a home from home. 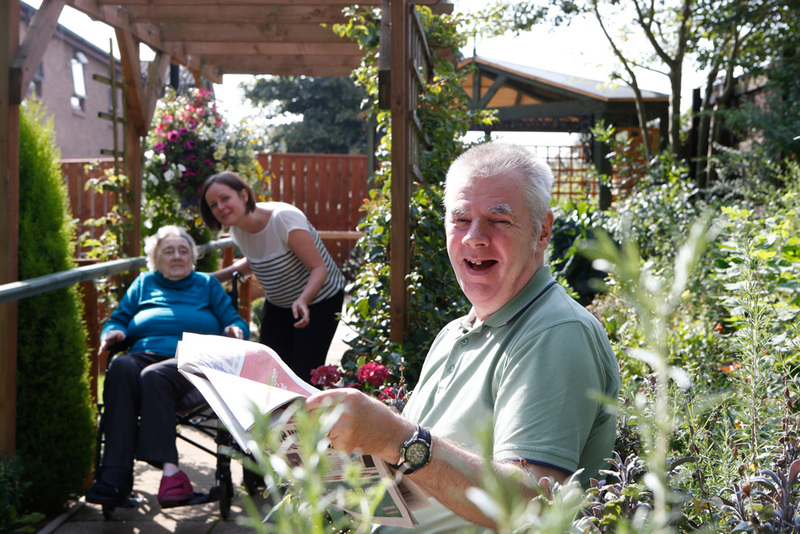 Our aim is to ensure our residents are content in their home. Whether that’s sitting quietly, watching TV or joining in some of the fun and engaging activities we organise – it’s entirely up to them. Visiting musicians, day trips and a range of social events organised by our in-house co-ordinator from quizzes to exercise classes, means there is always something to choose from. Our 46 single bedrooms are all furnished to a high standard with a suitable bed and range of furniture for each client’s need and are attractively decorated in schemes created by our interior designer. Each one has en-suite facilities and views onto the lovely gardens. For those that wish it, a direct dial telephone system allows residents to make and receive calls from relatives and friends in the privacy of their own room. To ensure peace of mind, a nurse call point is by each bed and toilet and assistance is never far away. Clients are welcome to bring their own ornaments, pictures and even their own furniture – maybe a favourite chair or even their own bed – to ensure they are happy and settled in their new home. Pets are also welcomed by prior arrangement. Ferguson Lodge offers a great choice for every meal. We are well known for our delicious home cooked food. Menus are planned carefully to promote healthy eating and meet all dietary needs but also offer some all-time favourites and the occasional treat! Our aim to provide food which is wholesome, nutritious and enjoyable for our clients both in taste and in presentation. We all eat with our eyes! On birthdays, anniversaries and any other occasion we can think of, there’s always a celebration with a home-made cake. Our dedicated activity co-ordinator can help clients continue to pursue their own hobbies or encourage them to try something new. You’re never too old to learn. It’s great for improving well-being and humour and is a great way to get to know the staff and their fellow clients. We are sure to take into account the different needs and abilities so that there’s something for everyone – from arts and crafts to ‘Pets as Therapy’ sessions. There’s impromptu sing-alongs as well as visits from beauty and hair therapists. Local entertainers perform regularly and wherever possible we make use of our garden and patio areas.